The Medela BiliBed is the latest innovation in the threatment of hyperbilrubinema. The BilliBed provides more intensive therapeutic light than fiberoptic and conventional phototherapy units because the infant can be placed directly on the unit rather than being wrapped in a fluorescent panel. 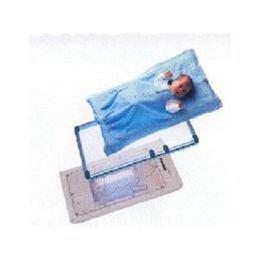 The single therapy light in the bed of the unit is covered by a transparent, waterproof plate. Precisely directed light and minimum distance to the baby provide higher irradiance levels with superb .therapeutic performance. Since the baby is treated in a bassinet or crib, mother and baby can be together while rooming-in at the hospital and also at home. Works in standard bassinets and cribs. No need for infant eye patches because light contacts only baby's body. No overhead warming lights to position or remove. Avoids chafing sometimes associated with fiberoptic panels. Portable and easy to store. Compact fluorescent tube blue light bulbs provide 40-60µw/cm2/nm or more irradiance and lasts approximately 1,500 hours. Dual hour meters track bulb life and total hours of operation. Uses standard A/C power. UL 544, IEC 601.1 and CSA C22.2 No 601.1.1. 66cm L x36 cm W x 13 cm H. 11 lbs.